Now that you've passed the boards, it's time to search for a job. Sounds easy, right? After all, you're bright, charming and dedicated to the practice of physical therapy! No matter how awesome you are, don't forget that, during the job application process, you're initially just some some words on a piece of paper. That can work for you, or against you. 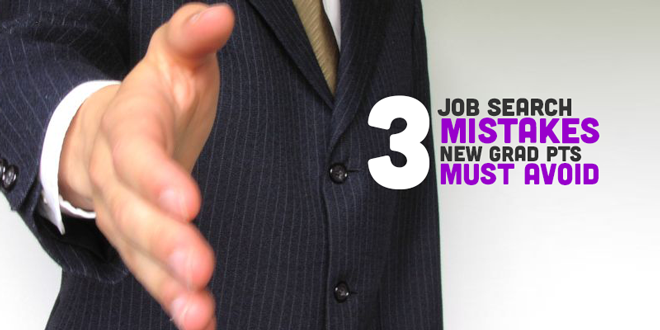 We connected with Melissa Totah LPC, NCC, career counselor at Wolfgang Career Coaching in Austin, TX, to provide this list of common new grad job application mistakes. The reason this section is called "confidence issues" is that being over-confident or under-confident can really hurt new grads during the job searching process. As a new grad, poor confidence will come across in your cover letter, as well as during the job application process. New grads will commonly downplay their experience level, failing to highlight clinical and internship experience on their resumes. Sometimes they won't realize that non-clinical job experience is also applicable. Say you worked at as a server during undergrad. Managing the tables and providing excellent services doesn't sound too different from managing a complex caseload! Some DPT programs teach students to be extremely confident in their abilities as new graduates, since they offer some of the the most recent evidence-backed education around. There is certainly some truth there, and graduates have much to feel proud of. However, experience provides much of what the most skilled physical therapists know about diagnostics, prescriptive exercise and manual skills. Some clinics do not appreciate a newly minted PT sashaying into the interview process, writing "Dr." this and "Doctor" that and boasting of being a "Doctor of Physical Therapy," especially if the team consists of highly trained clinicians who happen to not have doctorates. At the same time, clinics like Gaspar Doctors of Physical Therapy are working to establish an image of an accomplished team of doctorate-level clinicians. They would surely love an applicant to confidently call him/herself doctor. Know your audience when submitting applications. If you feel like you may come across as arrogant in your interviews, practice interview questions with a friend you trust to see how you come across. Remember, it's not all about you! The clinic/hospital/organization in question also has needs, and they're concerned about hiring the right candidate for the job. Top priorities of hiring organizations will vary. In larger hospitals and corporations, you may be one of many benefitted therapists in a large staff, and there is often an extended period of paid orientation and training involved. From their perspective, they will want you to be affordable, competent, and around for the long haul, after all the training and expenses involved with your on-boarding process. Emphasize your commitment to an employer in your cover letter and play up job experience with multiple years. Pay attention to cues in the job posting. Does a company say they are looking for someone "available as soon as possible"? If you're open to starting work quickly, make sure to mention that in your cover letter. Totah reports that as many as 80% of jobs are obtained through networking. With the advent of social media, connecting to peers and coworkers has never been easier. LinkedIn and Facebook can provide avenues to share articles about physical therapy. If you're hoping to land a job at a large hospital system, sharing news from their website via LinkedIn is a way to have evidence of your interest of them convey itself when the HR rep inevitably cyberstalks you! Learn how to leverage each social media platform. Amy Wolfgang, career coach, shares a few LinkedIn career tips in this fantastic article. When someone asks you to be a reference for them, how do you feel? Assuming you like the person, you're probably flattered and eager to help out! Why should it be any different for you? Stop thinking of using networking connections as bothering people or being a nuisance. You would do the same for them, and you probably will one day. Set aside your self doubt and start contacting people you met through clinicals, internships parents' friends and religious organizations. You never know who needs a new PT, or who knows a clinic owner who needs coverage. Have you heard of an informational interview? If not, consider taking out an associate or mentor that you admire. Even if you have never met the person, if you see that they have your dream job, they're someone you need to know. Offer to buy them lunch somewhere nice and pick their brain about how they got where they are. Chances are, they'll dig you and keep in touch. You never know where that will lead! What do you think, new grads? What helped you or hurt you during your job search?